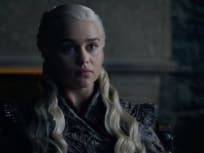 Game of Thrones Season 8 Episode 1 had some of the show's best quotes to date, and we've rounded them up for you! Read on, Game of Thrones Fanatics! Iain Glen has landed the role of Bruce Wayne on Titans Season 2! The popular Game of Thrones actor will appear in multiple episodes of the superhero drama. Maisie Williams made a memorable appearance on Jimmy Fallon's Tonight Show, and seemingly let slip a huge Game of Thrones spoiler. Watch the video. Game of Thrones is based in a fantasy world. Based on the best-selling novel "A Song of Ice and Fire," the drama is based around a battle for control, pitting knights, renegades and other against each other.